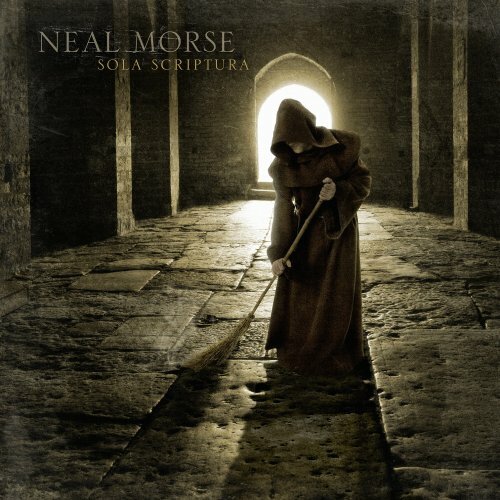 If for any reason you've avoided partaking of Neal Morse's progressive music, with the release of "Sola Scriptura" you now officially have no legitimate excuse. Over the last year I've been collecting some of his work (both solo and with Spock's Beard) and have come to admire his impressive talent. Not only is he proficient on keyboards, guitar and vocals he's a gifted songwriter and arranger. But on this album he manages to surpass even himself in melding metal, hard rock and contemporary influences into a total package. He has an uncanny ability on epics like this to see the "big picture." By now the trio of Morse, Mike Portnoy and Randy George know each other so well as musicians they sound like a group that rehearses day in and day out even though they only get together to record specific projects like this one. Yet they've never been more cohesive than they are here. The first movement, "The Door," begins with an exhilarating, spectacular overture. They waste no time plunging right into metal riffs with drummer Portnoy bedazzling your ears. Without even realizing it you've moved into the first song, "In the Name of God," a hard rock tune where Morse's voice has improved over the gravelly vocals he delivered on his previous album. The gist of the lyrics is that organized religion, no matter how spiritually pure at the beginning, becomes elitist and corrupted when it is left in the care of human beings. In Martin Luther's case the church had become just another political system that set up a hierarchy the common people had to bribe for salvation. And if they didn't go for that scam then the priests would inform them that "In the name of God you must die/All that's not our truth is a lie." Pretty harsh stuff. So ML felt compelled to do something about it. The song slips into some very intense metal riffs, then we get the noble "All I Ask For" which is a terrific song of praise. Here ML, in his devotion, only wants God's will to be done in his life. The chorale work is great, then Morse introduces a major musical theme that will reappear from time to time. Yet another hot metal passage takes you to "Mercy For Sale," a strong rock tune wherein the concept of the prophesized false teaching that has possessed the church is addressed with "If you think the whore is only history/Are there those who teach her lies?" The instrumental afterward is a showcase for Neal's impressive skill on guitar. Without a hitch you find yourself in "Keep Silent," a bluesy but trendy song that expresses ML's understandable dilemma of knowing things have to change yet "I don't wanna be the one/to bring the curtain down/I'd much rather stay at home/and keep what I have found." Morse uses a studio orchestra at the end and it's highly effective. Piano and strings play beneath the first two verses of "Upon the Door" that describes ML's famous, revolutionary act of heresy. The guest guitarist, Paul Gilbert, strikes like a bolt of lightning with some awesome shredding here, making the full-band final verse a fitting end to the first movement. Part Two, "The Conflict," also begins with some serious prog metal riffing with Gilbert once again parting the sky with his licks. "Do You Know My Name?" has a devilish, sinister feel and it serves to illustrate the despicable egos of the church honchos with lines like "I'm your priest/I'm your king/I'm a saint/This 'love your enemies' thing's down the drain." Next comes a conversation between the elders and ML in "Party to the Lie" whereupon they threaten ML with "Father we must crush him/and he never will be found." It's straightforward rock that transitions into a tightly structured instrumental section where Mike Portnoy plays his buns off as they roar through intricate changes and accents. ML wisely lays low in "Underground," a calmer change of pace tune, then you hear some precise acoustic guitar from Neal that leads to a flamenco rhythm on "Two Down, One to Go." The words describe how ML's petition spreads like wildfire across the world. Morse's piano solo and Portnoy's amazing brush work (Yes, Mike can play anything!) are a delight. The church big shots are now in panic mode and they burn all the books in the rocker "The Vineyard" that spotlights Neal's keyboard expertise on a Hammond organ and synthesizer ride. You'll swear you'd somehow switched CDs to one by Santana when you hear Morse's guitar and the backing percussion at the start of "Already Home" but it soon settles into an easy blues tempo. Here ML expresses that even though "I stand accused/I'm beaten, used and tired" his unwavering faith comforts him, as if he's already home with his maker. Part Three is just one short song, "Heaven In My Heart." Neal usually includes a pretty song or two on his albums and this one's a power ballad with plenty of huge orchestration. It's a well-composed reaffirmation tune (but I doubt he'll ever top his exquisite "Cradle to the Grave" from "One.") The fourth movement is aptly titled "The Conclusion" and it bursts out of the gate with "Randy's Jam" that "gives the bassist some" in a furiously paced instrumental interspersed with staccato lines and featuring a full-chord descending piano progression. Morse brings us back to the 21st century with the Tom Petty-ish sounding "Long Night's Journey," a catchy rocker with super orchestration. An instrumental where the theme recurs and Portnoy tears up his kit once again takes you to "Come Out of Her." Here Neal pleads for today's congregation to escape the hypocritical clutches of modern money-mad evangelists and "like Martin did before us/let the scripture be our guide." It has a slow rock feel and more of the brilliant chorale. "Clothed With the Sun" is a stately return to earlier moments including "All I Ask For" and it is a true emotional release for the listener. The counter melodies sung by the full chorale emphasize uplifting hope that the church will right itself once again. "In Closing" is just piano and vocal as Morse asks, "who will stand up for (God's) truth?" and adds, "Maybe it is you he's looking for." I know. It's a long review. But, hey, there's an hour and sixteen minutes of quality prog here and I'm excited about it! I think it's Neal Morse's best so far and that's saying quite a lot since his previous music is nothing to scoff at. You will certainly get your money's worth, that's for sure. What makes this one stand out from the others is the incredible blend of styles that he presents seamlessly without one single glitch or awkward second. It gets straight A's across the board in every category.